We’d like to share a couple of awesome ways to share, view, and experience historical media. SepiaTown is a user-driven database that matches historical photographs with locations on Google Maps. Users upload photographs, add the location the photograph was taken, the date it was taken, and any additional information about the picture. 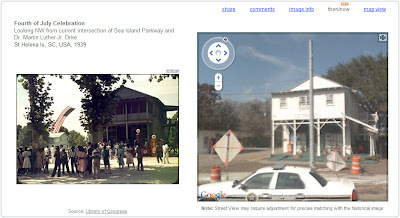 The “then/now” feature provides a side-by-side comparison of the historical photo to the Google Maps Street View. Users can do a keyword search, or look at images associated with featured locations. Check out the SepiaTown Blog to learn more about features and collections. The ARIS game platform uses historical images and videos to create mobile games that allow the player to relive past events in the locations that they took place. An example is the game Dow Day, which displays videos and images from Dow Day in 1967 when a player visits certain locations around Madison. Dow Day: A game designed using the ARIS game platform. ARIS was created to allow educators to create mobile games that integrate learning and augmented reality (the concept of using technology to add additional information to an existing environment). Educators/developers have created more than historical games using ARIS. Some examples include, campus tours, museum exhibits, foreign language instruction, bird and plant species identification, and one from the Library of Congress on using primary sources. Games created by ARIS are currently only available on the App Store. The popularity of graphic novels has been growing not only among young adults, but adults as well. At the Mudd Library, we’ve been adding a lot of new materials to our graphic novel collection- a couple of which are featured below. Fun Home: A Family Tragicomic by Alison Bechdel: An amazingly candid and engaging autobiography of Ms. Bechdel’s childhood and early adulthood, particularly relating to her father. This graphic novel has basically become a community read among library staff. Duncan the Wonder Dog by Adam Hines: A story of a world in which animals have the ability to speak, and how they use that ability to empower themselves against humans. Our collection also includes classics such as, Watchmen and The Sandman series, as well as the very popular Scott Pilgrim Vs the World series. Check our library catalog to browse our entire collection of graphic novels. Chill Out @ the Mudd! Looking for a fun way to stay cool on Friday afternoons this summer? 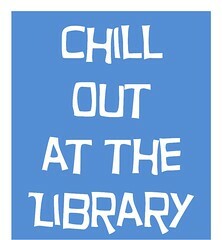 Why not come to the library? We will have a variety of board games, puzzles, coloring books, card games, and video games available to play in the library. Check out a movie from our staff movie picks to watch over the weekend, or watch it in one of our temperature-controlled viewing rooms. Games will be available every Friday from 1 to 4pm, all summer long. Time for Canine Therapy at the Mudd! Stressed out by finals? Need a study break? Perhaps you could use some canine therapy from our friendly and cuddly puppy pals! Join us on the library plaza on Tuesday, May 31st. Dogs and their people will be standing by from 2:00 to 3:00 pm. Would you like to add some art to your evening? Stop by the Mudd Gallery Saturday, March 26 (tonight) for the opening reception for Recent Work by Annie Raccuglia. Reception will last from 5:30 to 7:30. This exhibit will be displayed in the Mudd Gallery from Saturday, March 26 through Tuesday, April 5, 2011. You know that we strive to provide you with the best resources available for all of your research needs, but did you know that there’s more to the Mudd library? Today, we begin a new series called “What’s in the Mudd”. 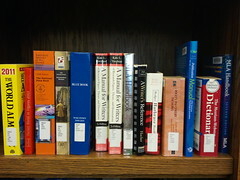 Stop in the library and take a look at our display of interesting and unusual resources. Better yet, take one to the circulation desk and check it out. Pincus and the Pig: A Klezmer Tale– You know and love Peter and the Wolf. Here it’s performed by the Shirim Klezmer Orchestra. Includes a helpful Yiddish glossary. As a bonus, includes Klezmer versions of Brahms, Satie, and Mahler. The Ramones, Anthology– The accompanying booklet says “loud and fast.” We think that sums it up nicely. Airplane!– The “Don’t Call Me Shirley” edition. A hilarious homage to disaster movies. Technically, there is a plot, but mostly it’s a string of one-liners. A classic. Super Smash Brothers Brawl– The back of the game case claims, “There’s no end to the smashing fun.” It’s true- ask a friend. Dr. Seuss, The Cat in the Hat– Read it in English or attempt it in Russian. Perfect Hips: Belly Dance Workout– Need we say more? Caribbean Cooking for Pleasure- The Mudd library has scads of cookbooks. You can find them by using the term “cookery” as a search term in LUCIA. International Sound Effects Library, volume 1-28- We are featuring volume 3, which contains such sounds as rat squeaks and baboon barks. All this month, we will continue to delight and surprise you with some of the Mudd library’s hidden gems. Did last week’s spring-like days motivate you to get outside and get active? Even though the ground is once again covered with snow, the Mudd Library can help you maintain your exercise and healthy living motivations. We have a growing collection of exercise videos available to check out. Some of our newest titles include, Yoga for Beginners, Step-by-Step Strength Training, and Perfect Hips: Belly Dance Workout. The Mudd Library staff can tell you that Wii Sports Resort can be a great workout, as well as a lot of fun to play. If you don’t have your own Nintendo Wii console, the library has one available for loan. If you’re interested in researching wellness, our reference librarians have put together a Wellness Resources library guide. This guide includes information about wellness related electronic databases and websites, as well as tips for finding wellness related books in our catalog. 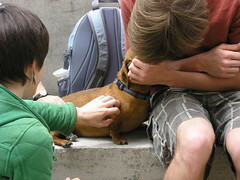 Of course, the library is not the only place on campus for those interested in wellness. WelLU, Lawrence University’s committee on wellness, has been actively encouraging wellness on campus. Take a look at their web page, or visit the newly remodeled Buchanan Kiewit Wellness Center. The student organization, LU Wellness Committee, focuses on wellness related issues of particular interest to students, such as sexual health/body image and stress management.